Sniper is probably your best ability choice for Octillery. Critical hits will do 3x damage instead of two if they land. As a Trick Room based sweeper, this can come in incredibly handy. Suction Cups can be handy as well. It prevents Octillery from being affected by moves that force a switch like Roar. Since Trick Room only lasts for five turns, every turn spent switching in and out can be detrimental. 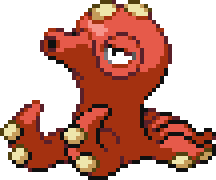 Moody is Octillery's Dream World ability, and it raises one of its stats by two and lowers another by two every turn. Stat fluctuations can be frustrating, especially if Octillery has its accuracy lowered, or its speed raises enough to negate the Trick Room benefits. Don't do it. You'll thank me later. The movepool for Octillery is amazing. It learns a variety of moves and has amazing type coverage as a result. Its Attack and Special Attack are equal, which allows you to have a great deal of variety as well. At a base stat value of 105, they aren't anything to shake a stick at either. We will be focusing on a Special Attack build this week though as the majority of the hardest hitting moves it has are special attacks. With a base stat of 75 in HP, Defense, and Special Defense, Octillery is best suited to be artillery and not a meat shield. Artillery. Octillery. Get it? I'm so witty (Still waiting on my Pulitzer people). Unfortunately, Octillery is slow. Very slow. With a base Speed stat of 45, even with a helpful nature, 31 IV, and 252 EVs, it's losing the race. But that is where Trick Room comes in handy! Slower attackers go first under its effect, so with Octillery, you should actually shoot for an IV of 0 in Speed when breeding, and don't let me catch you putting a single EV point into speed. The slower the better. Water Spout Varies 100% Does damage equal to 150 * Current HP / Max HP. At full health it has 150 power. Surf 95 100% Hits all adjacent Pokémon including teammates in double and triple battles. Note: You should shoot for a bred IV of 0 in speed. A Quiet nature ensures the lowest Speed stat possible while boosting Special Attack. Instead of telling you what moveset to go with this week, I thought I would give you the Shrimp Sampler Platter™ equivalent and list a helping of moves that you can substitute to your liking. I would definitely recommend taking Water Spout. STAB plus 150 damage is frightening. Couple that with Wave Incense, which boosts Water attacks by 20% and you can take out a large variety of opponents. It loses effectiveness as Octillery loses health though, so I would recommend pumping HP EVs and perhaps taking on Surf as an alternate STAB move if you do pick it up. The rest of the moves can be mixed and matched. Flamethrower is good for Grass and Steel coverage. But ultimately, with so much variety, you are bound to find something you like. In terms of items, Wave Incense is good for boosting Surf and Water Spout. Life Orb is another good one to boost attack power, but don't use Life Orb if you go with Water Spout as it takes off 10% of Octillery's health per turn, which undermines Water Spout's damage. Expert Belt is also a viable choice as it increases super effective move damage by 20%. With such a varied moveset, you can make full advantage of it on Octillery. Since Octillery cannot learn Trick Room itself and is rather squishy, you will need to have a teammate with Trick Room to set up. Once Trick Room is set to go you can switch Octillery in and go nuts. Bronzong is a great choice for a Trick Room user. His speed is horrible, but his defenses and type-resistances are amazing. Another good choice is Banette. Basically you use Destiny Bond and Trick Room and sacrifice the poor thing to the Pokégods eliminating your competition in the process. 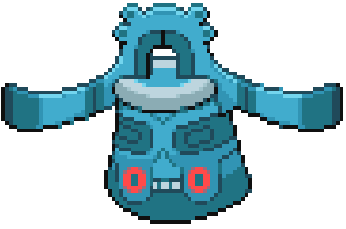 You can find a full list of Pokémon that can use Trick Room on Bulbapedia. In terms of other Pokémon that can benefit from Trick Room, I would definitely suggest Marowak as a physical attacker. Armed with a Thick Club, it becomes a powerhouse with access to a STAB Earthquake and Swords Dance. Dusknoir is another good physical attacking choice as he also has access to Trick Room. Druddigon is a slow but hard hitting physical Dragon-type. Slowbro is also a great addition to a Trick Room team as he is physically defensive and has access to Trick Room and STAB Psychic- and Water-type attacks. Escavalier's Bug and Steel typing allows for a ton of resistances, and with a 135 base attack stat he becomes a nightmare train to Poundsville USA on raging tracks of blood and fury under the effects of Trick Room. Trick Room is definitely a bit gimmicky and can be a bit tricky to use, but the benefits are worth it. Octillery really shines on this team where his lackluster speed is outclassed otherwise. With Trick Room the tortoise becomes the hare. Raspberries become potatoes. Cats and birds drink and stumble into Perkins at 2:00am together. The artillery octopus becomes the… he… he lives up to his namesake! That's it. Nailed it.